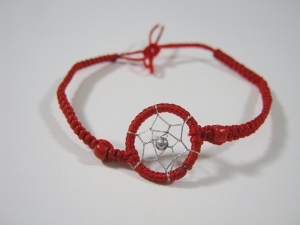 These dreamcatcher string bracelets are handmade by the Inka of Peru. The metal rings are 0.5" to 0.75" in diameter. The bracelet is 6" long with 3" long ends for tying. Two bracelets weigh 0.1 oz. They come in assorted colors. Please let us know if you have a color preference when ordering and we will do our best to get you the color that you want. Please let us know your first choice and second choice. If you do not specify a color at the time of ordering, we will pick a color at random.